COPENHAGEN, Denmark (CNN) -- Rio de Janeiro, Brazil, will host the 2016 Summer Olympic Games, the International Olympic Committee announced Friday. 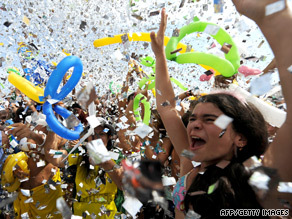 Confetti flies in Rio de Janeiro after the IOC announces the city will host the 2016 games. The announcement brought tears to Brazilian President Luiz Inacio Lula da Silva, who dabbed his eyes with a handkerchief several times in a news conference afterward. "Our hour has arrived," he said. "It has arrived." In Rio, jubilation erupted at the world-famous Copacabana beach, where thousands of people gathered to hear the announcement. Rio organizers promised to start working immediately to make the games a success. "Maybe some of the people tomorrow can rest," said Rio 2016 President Carlos Nuzman. "I'm not [resting]." Rio beat Madrid, Spain, in the final round. Chicago, Illinois, and Tokyo, Japan, were eliminated in earlier rounds. For Rio, a major appeal was bringing the Olympics to South America for the first time. IOC President Jacques Rogge said in the news conference afterward that in addition to its excellent bid, Rio had the "extra added value of going for the first time to a continent that's never had the games." He also noted that Brazil helped its chances this year when it did not get the 2012 games awarded four years ago. "Rio remained humble," he said. "They wanted to listen, to repair their shortcomings." More than half of Rio's Olympic venues are built, including state-of-the-art facilities constructed for the 2007 Pan and Parapan American Games: the magnificent Joao Havelange Stadium (the proposed 2016 venue for athletics), the Maria Lenk Aquatic Center, the Rio Olympic Arena (which will host gymnastics and wheelchair basketball), the Rio Olympic Velodrome, the National Equestrian Center and its close neighbor, the National Shooting Center. • Barra, the heart of the games, is an expanding area of Rio that will require "considerable infrastructure and accommodation development." It will house the Olympic and media villages and some venues. • Copacabana, a world-famous beach and major tourist attraction, will host outdoor sports in temporary venues. • Maracana, the most densely populated of the zones, will contain an athletic stadium and the Maracana Stadium, which will host the opening and closing ceremonies. Major redevelopment is planned for the zone. • Deodoro has little infrastructure, but the highest proportion of young people. It will require construction of Olympic venues. The city's bid was helped by a strong economy and guaranteed funding. Brazil's economy is the 10th largest in the world and predicted to be fifth by 2016. Brazil told the IOC its commitment to the Olympics could be seen in the investment already under way in Rio. Maracana Stadium will close next year for two years of refurbishment. The areas around it will be renovated, with improved access and transportation links. The entire neighborhood will be reborn, the Rio committee said, to host the final of the 2014 FIFA World Cup. Work is already under way on the ongoing development of the Olympic Training Center, which includes many of the state-of-the-art venues built for the 2007 Pan and Parapan American Games. This was Madrid's third attempt at hosting the Olympic and Paralympic Summer Games. Madrid's chances might have been hampered, however, by a recent tradition that consecutive Summer Olympics aren't staged on the same continent. The London, England, 2012 Olympics will have happened just four years before 2016. "Although there's no rule against it, the IOC has yet to award consecutive summer games to the same continent since 1952 in Helsinki," Hula said. "You can play a great game and still not win," Obama said after returning to the White House. "Although I wish we had come back with better news ... I could not be prouder of my hometown." Obama said he believed Chicago had made "the strongest bid possible." "I'm totally stunned. I thought we had a great opportunity," said former NBA great Michael Jordan. Jordan, who led the Chicago Bulls to six NBA titles, said the city would have been "perfect for the world to explore." He said Chicago is "deserving of an event of that magnitude" and hopes it will try again. U.S. Rep. Danny Davis, a Chicago Democrat, said the loss is "kind of heartbreaking. ... A tremendous amount of effort has been put into trying to win the bid." The response around the city was not all negative, however. Many residents are "almost glad the distraction of the Olympics" won't be there, noted CNN's Ali Velshi, who was in downtown Chicago when the news was announced. Many residents feel it will allow local political and business leaders to "focus attention back on what Chicago needs to do," Velshi said. Obama, the first U.S. president to make an Olympic bid in person, was flying back to Washington when the announcement was made. He was disappointed with the outcome but not sorry he made the trip to Copenhagen, White House spokesman Robert Gibbs said. The heads of state for the other three finalists also made personal pitches. Spain's King Juan Carlos and Queen Sofia and Spanish President Jose Luis Rodriguez Zapatero pushed the case for Madrid. Recently elected Japanese Prime Minister Yukio Hatoyama made a bid for Tokyo. Brazilian President Lula da Silva was joined by soccer legend and Brazilian native Pelé as they advertised the benefits of a Rio games. An animated Lula da Silva, surrounded by Rio supporters, said at a news conference after the announcement, "Among the 10 major economies of the world, Brazil was the only country that had not received the Olympic and Paralympic Games. For us, it will hardly be our last Olympics. For us, it will be an opportunity to be equal. It will increase self-esteem for Brazilians, will consolidate recent conquests and stimulate new advances."